While searching through my bookshelf for a book, that I have since remembered I loaned out, it got me thinking just what, how and why people organise their bookshelves. So low and behold, a blog post is formed. So, myself, and our spell-checker Jacqueline (and hopefully one day contributor) have taken pictures of our bookshelves for all to see and you may well see the difference between then all. Myself and Jacqueline’s are both tall bookshelves and not seen in this post is Emma’s long bookshelf. Just whos bookshelf is yours like? Well, as you can see I have, what I like to call a “Box Bookshelf”. This allows me to compartmentalise everything into nice little neat spaces. Out of 12 boxes (two not shown) two are general storage containers, another two have trinkets and money tins and finally eight hold all my lovely books. I have to admit, I quite like having my bookcase all organised where I can easily grab certain books. 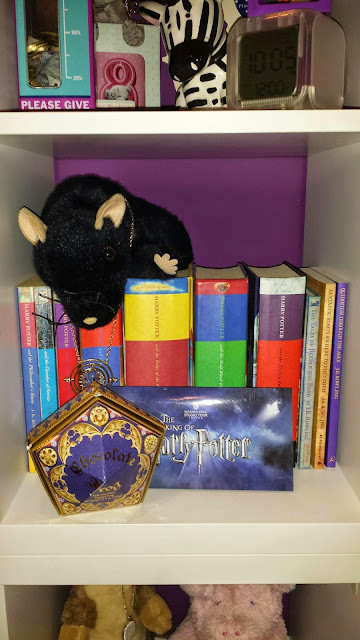 As seen below, I have a Harry Potter (J.K. Rowling) shelf where all my books reside, a chocolate frog, a Harry Potter Studios ticket and a rat puppet with a time-turner like to hang out. 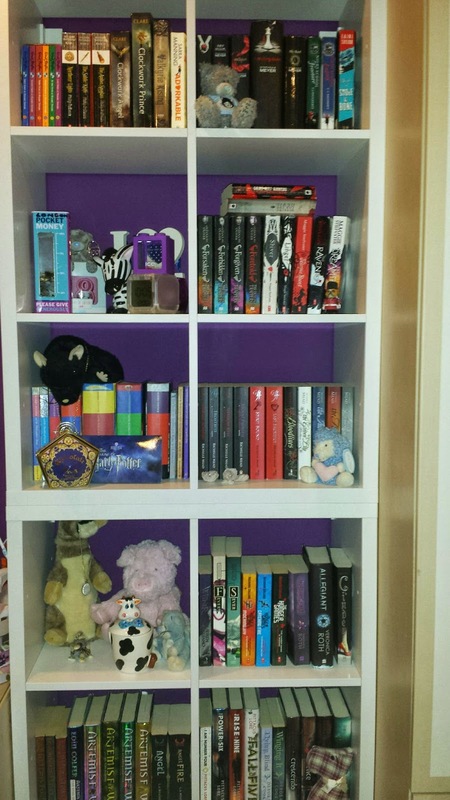 I also have a Vampire Academy and Bloodlines (Richelle Mead) shelf as I seriously love that series… and all the books fill up the space. Which will be ruined when the final Bloodlines book is released next year! I also like to group series together, so my Artemis Fowl (Eoin Colfer) series is nestled together as is the Chemical Garden Trilogy (Lauren DeStefano) and His Dark Materials (Phillip Pullman). If I don’t have the entire series, I will group the books I do have together and settle them with other discarded series of similar genre, or stand alone books I love to read. Behind some of these are other books that just don’t warrant a “top shelf” placing in my bookshelf but I still want to own. Those eagled eyed amongst you might see the two books lying on top of the others, this is a series of five I have recently gotten and have almost finished, and once finished they will be placed accordingly into the bookshelf. My favourite books in this bookshelf are my Harry Potters, Vampire Academys, Cinder (Marissa Meyer, Rest of the series is on Kindle. This is an American edition) Smoke and Bone (Laini Taylor, again American edition and rest of series on Kindle) and finally Adorkable (Sarra Manning). Although to reach the bookshelf I actually have to like them! Anyone else have a multi-purpose bookshelf like mine where there is books and display? 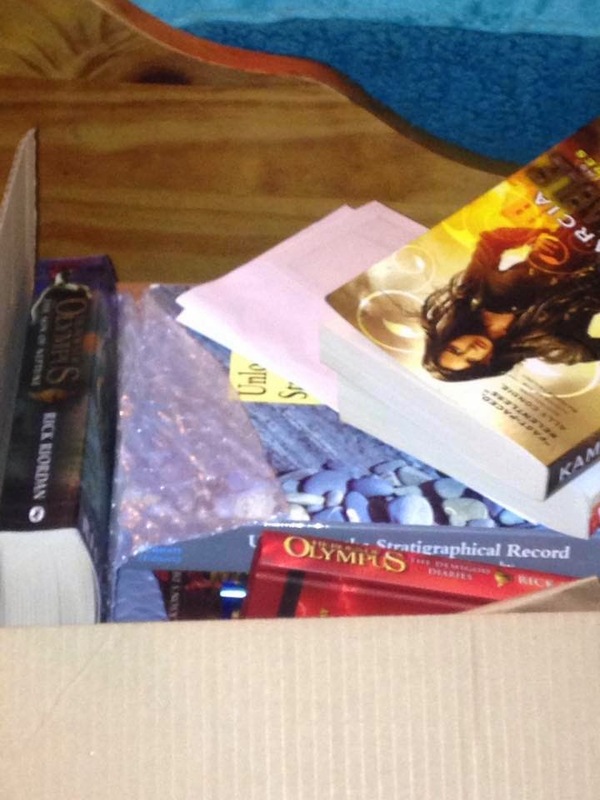 Are you as organised with your authors and series? What sort of person would you think I am looking at this bookshelf? Welcome to Jacqueline’s bookshelf where there is a distinct difference in her shelves. Her bookshelf is built into the wall which allows a really nice design element and deep shelves. As seen in the second picture she can fit lots of books on each shelf whether piled high or stacked deep which allows for added storage of books, and the opportunity of a good hunt for that one book that has a quote you just HAVE to know. You might have guessed that the second shelf is where her favourite books stay. Percy Jackson aswell as Heroes of Olympus (Rick Riordan) and Harry Potter (serious Harry Potter book collector and all round Potterhead here, also this is around 75% of her Harry Potter books as she has the adult editions for when she is a “real grown up”) are neatly organised and the books are easily grabbed to get that quote. There are also a couple other series and general books located on this shelf. 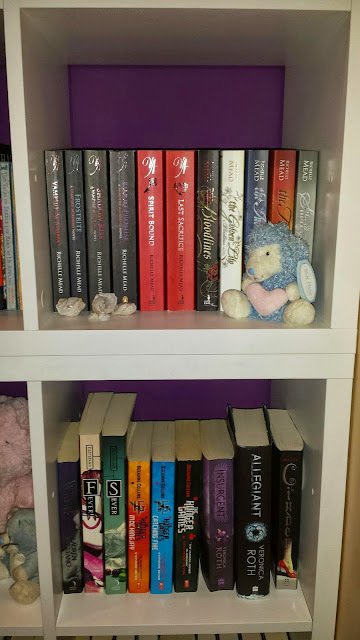 Looking up the shelf is pretty organised with the Morganville Vampires series (Rachel Caine) clearly visible with a selection of other series starters and stand alone novels along side. shelf that almost every student will have. The course material. This is neatly arranged for the grab-and-go life of a student. The final picture holds the “stratigraphic principles box”. Or for us simple humans, the box of other books which don’t have a place on the shelf. I’m sure we all have an area like this and just have never got round to sorting them away. Especially in a society of rushing sometimes we just never get round to the little things, especially with books on kindle libraries not requiring the time or effort to stow away. 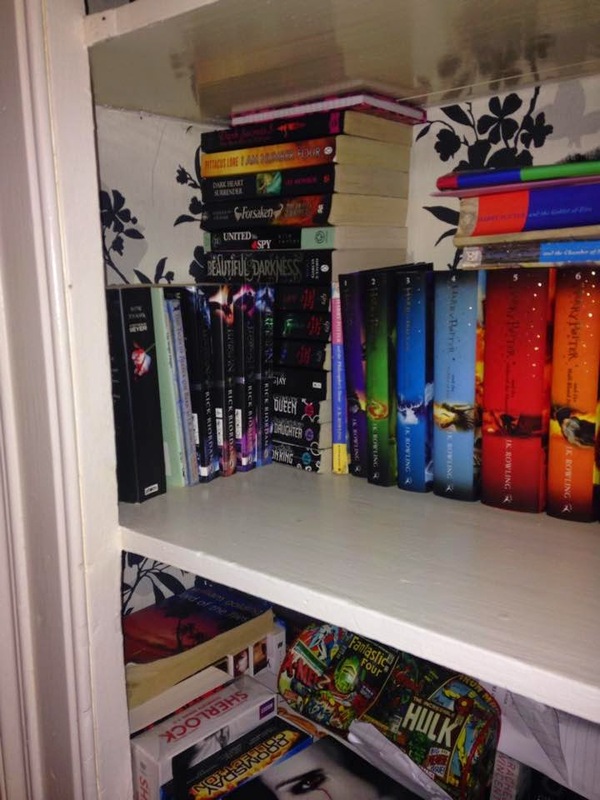 Asking Jacqueline what books she would pick in a top four, on top came the Harry Potter and Percy Jackson series followed by The Maze Runner (James Dashner) and Benedicts series (Finding Sky trilogy. by Joss Stirling) although she loves all her books equally and said it was hard to pick favourites and would probably change dependant on how she is feeling. What does this make you think of Jacqueline? Does her bookshelf say alot about her? 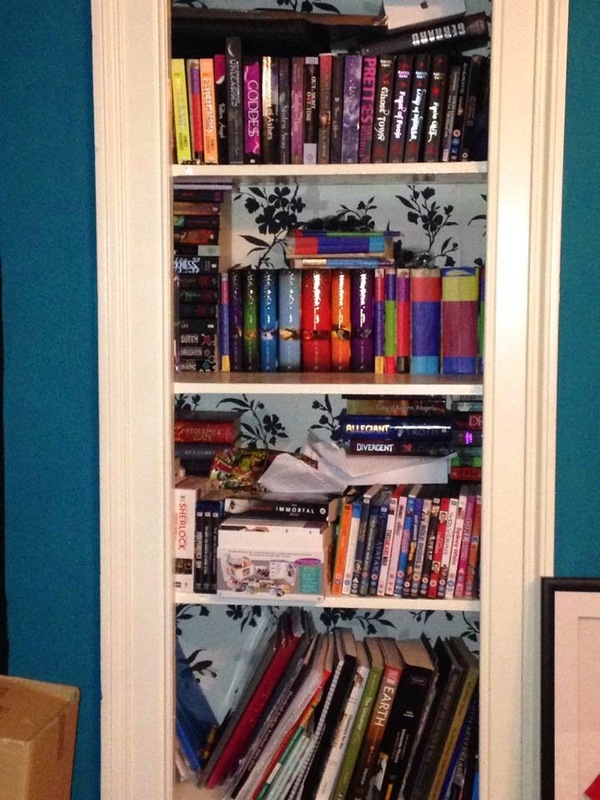 So Just what sort of bookshelf do you have and what does it say about you as a person?